It Could be the Fonts! Have you ever looked at a website and knew that you liked it but weren’t sure why? How about one that you did not like, but weren’t sure why…. Well, it could be the fonts! Fonts play a SUPER important role in how a person feels or reacts to a website. Fonts create a feeling for the page, whether it be strong, soft, romantic, funny, serious, conservative, playful, happy, or one of many other emotions. When you are working on your website, I encourage you to pay particular attention to the fonts chosen to create the emotional reaction you desire from your visitors. For many years, we web designers were limited to a small number of fonts for designing. One of the reasons for this is that if a font from a website is to display on a visitor’s screen, the visitor must have that font installed on his or her computer. This can be challenging as each computer has different fonts installed. Recently two major revolutions have been made in the world of fonts and websites: Google Web Fonts and Adobe Typekit. Now there are hundreds of choices for your site! But be careful! Too many fonts on one page looks messy. You should use 2-3 fonts on a page, sometimes a few more if you can get away with it. We like to use a nice dramatic font for the titles of our pages and our headings, and an easy to read font for the body text. If you can focus on finding complimentary fonts, you will be successful. Here is a great article on how to choose fonts that compliment each other. 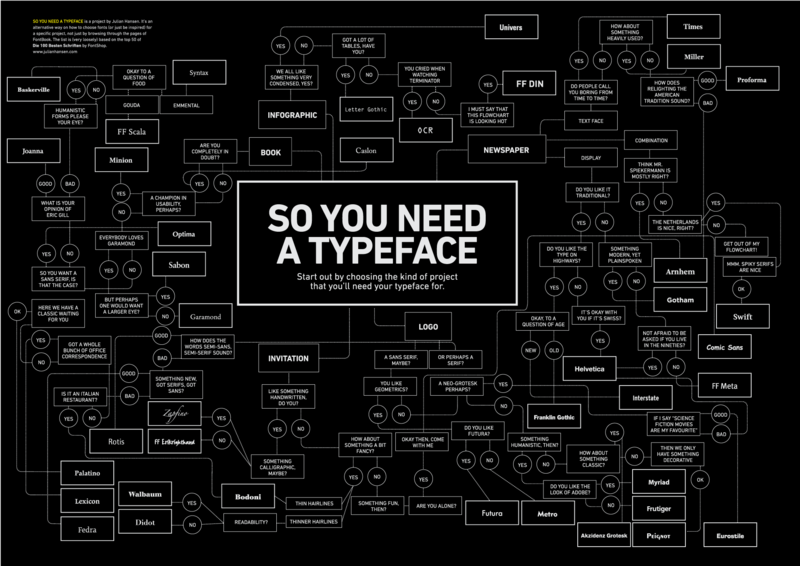 Years ago I found this fun infographic on how to choose a font. Check it out. Take a look at a sample of websites below to view their fonts, and see if you get a different feeling immediately from the typeface chosen. If you are looking to change your website a bit, contact us and maybe a font change is all you need!